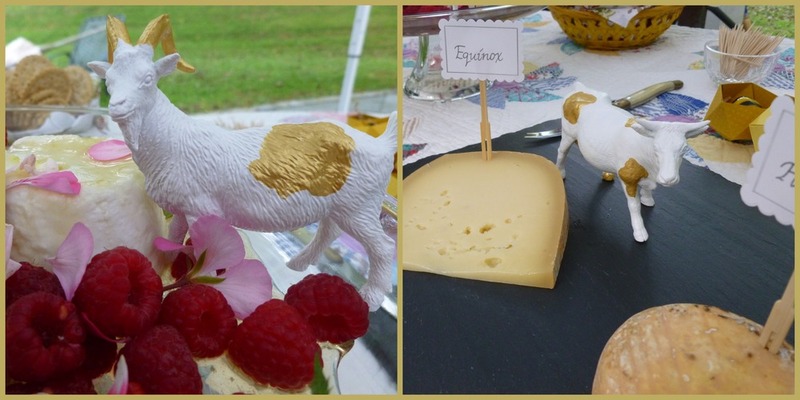 Last week we had the pleasure to host a cheese tasting at a wedding shower. We of course featured cheeses from our cheese makers - Birchrun Hills Farm and Shellbark Hollow Farm. From Shellbark Hollow - Sharp 2, Chevre Biscuits Marinated in Honey, and Herb Blast. From Birchrun Hills - Equinox, Fat Cat, and Birchrun Blue. We used baguettes from Saint Peters Bakery and gluten free from Amaranth for sampling. The raspberries from the market looked beautiful with the cheese. Don't you love the livestock - thank you Pinerest! Toy cows and goats, painted white, and highlighted with gold paint. Goats for Shellbark, cows for Birchrun! What a cute idea. Take a look at our table setting - a vintage quilt for the table covering, flowers from Rustic Bunch. And for a little favor - a honey Bee from John and Kira's. We made origami boxes to mimic a honeycomb to hold the honey bees. This was such a fun cheese tasting - what a great way to introduce a group of friends to the great products available at the farmers market!